Written by a former Squadron Leader who took part in the raid and based around interviews with air crew, ground crew, and their German adversariesThis is the story of the Lancaster bomber and the sinking of the battleship Tirpitz. Two of the most legendary war machines of World War II, they symbolized their nations' quests for victory in history's greatest ever conflict. The Lancaster was Britain's main heavy bomber—RAF Bomber Command's "Shining Sword"—whose role was to take the fight to the enemy, delivering deadly payloads to targets deep in the heart of Germany. It was used in the famous Dam Buster raid, and later in the war carried out critically important precision-bombing missions on targets such as the V-weapons complex at Peenemunde. The Tirpitz was Germany's largest warship. This leviathan of a battleship boasted eight 15-inch guns and weighed 2,000 tons more than her sister ship the Bismarck which was sunk by the British in 1941. Stationed for most of the war in a Norwegian fjord, Tirpitz helped deter the Allied invasion of Norway and threatened the Arctic convoys, which were an essential lifeline for the Soviet Union. 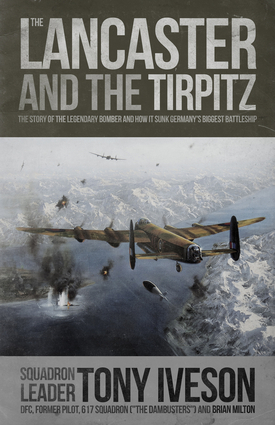 Written by a former Squadron Leader of the 617 "Dam Busters" Squadron, who took part in the Lancaster-bomber raid that finally sank the Tirpitz in November 1944, this is a readable account full of first-hand memories that take the reader to the heart of the action. Tony Iveson (1919-2013) was a Royal Air Force pilot who took part in 27 operations, including the sinking of the Tirpitz, and was awarded a Distinguished Flying Cross, Air Efficiency Award, and Battle of Britain Clasp.